CorProfit made a strategic decision to provide a Data Mart that would integrate with third party BI technologies. At the enterprise level of applications, being medium to larger company, you may already have selected a corporate dashboard technology and it makes sense to have KnowRisk “feed” risks data to participate in a bigger picture of your risk and governance landscape. 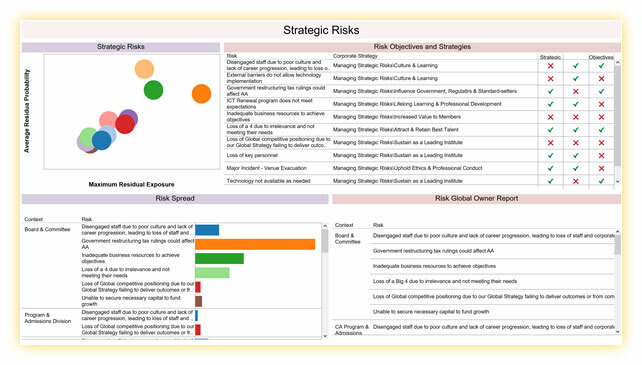 Dashboard visualisations helps to quickly identify and comprehend key indicators in your risk management and governance initiatives. Available on tablets and mobile devises, these modern technologies become increasingly relevant as the volume and detail of your ERM data increases. Being able to slice and dice your data so effortlessly provides a better basis for decision making, giving you insights that were not previously attainable. Dashboards can be accessed from the web and link directly to KnowRisk Forms to provide a complete Round Robin experience – data entry to dashboard to data entry. All of your key measures risks are accessible through a well-designed dashboard reducing the reliance on multiple reports.